There is still ice on the lakes and patches of snow in shady corners, but spring is here. Melody Maple tree in my front yard burst into bloom earlier in the week. The buds on my cherry tree are swelling. My serviceberry, elderberry, chokecherry, currants, apples, honeyberries and gooseberries all have swelling buds too. I keep looking closely at my grapevine. It was a hard, bitterly cold winter and the grape, while hardy to regular winter temperatures, is not guaranteed against record breaking polar vortex temperatures. I think it is showing life but I can’t be sure at this point if it is true or wishful thinking on my part. I will know for sure by next weekend most likely. Before things got too far along, James and I were out moving the bush cherries and a gooseberry this afternoon. The cherries were on either side of the hazelnut and it was getting rather crowded. Since we are removing the Japanese beetle attracting honeycrisp apple tree, we have some prime real estate opening up for the cherries. The gooseberry we moved was under the apple tree and we relocated it to under Walter, the crab apple. The gooseberry will be in good company there with a black currant, rhubarb, and strawberries. 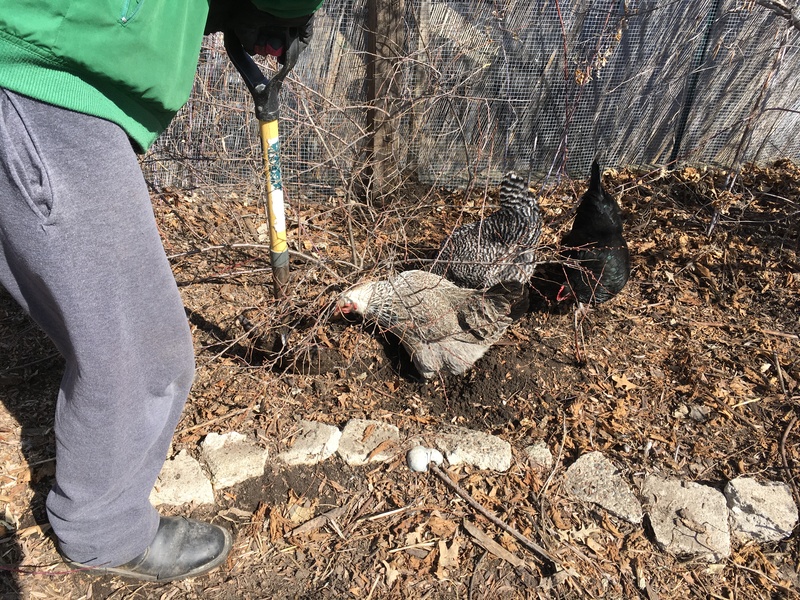 Of course, the Dashwoods had to assist in the digging and transplanting. They were so excited to help. 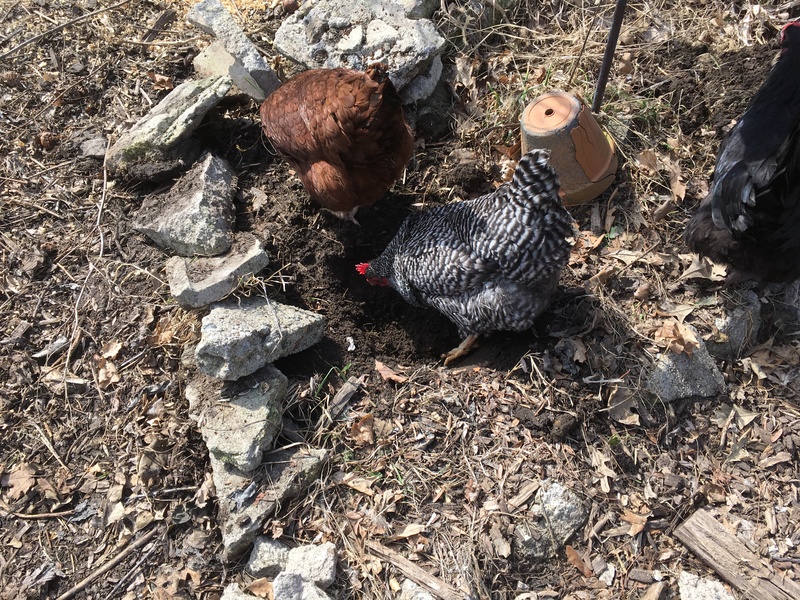 We first dug the new holes and the Dashwoods hopped in, scratching and digging, intent on finding yummy seeds and bugs. When we were digging around the cherries to lift them out, the Dashwoods were there to help as well, scratching and digging. 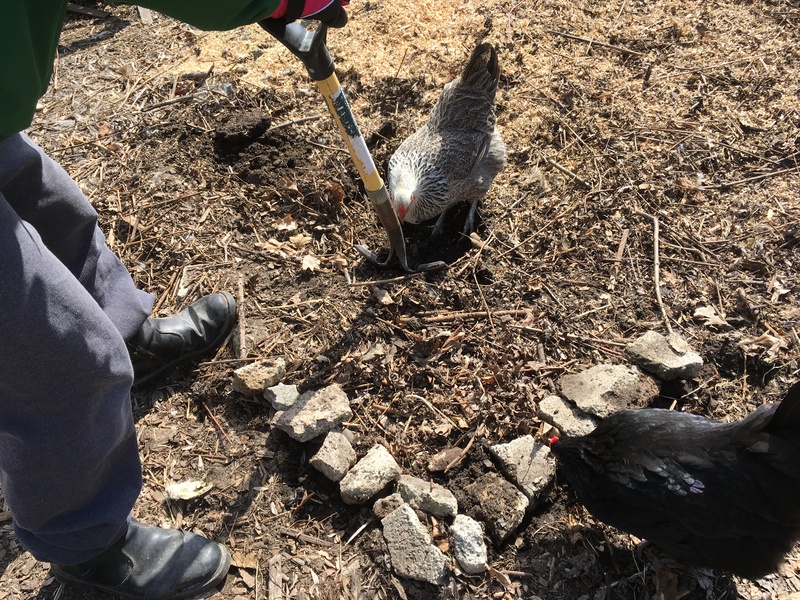 At one point James had the shovel stuck down in the dirt and was levering it, lifting the cherry from below, and Marianne tried to jump into the gap between the shovel and the ground. She was a bit dismayed to have the ground suddenly moving up and down beneath her. When I was watering the newly replanted shrubs, the Dashwoods were there too, sipping from the muddy water before it soaked into the ground. And after we lay straw down around the base of the shrubs for a little mulch, the Dashwoods decided it needed some rearranging. We were all of us happy. The Dashwoods clucking and cooing with joy and chirruping excitement. James and I laughing at their antics and sternly moving them out of the way of the shovel with a foot or hand so no one got hurt. After the shrub moving, I did a bit of work cutting back some of last year’s perennials. The Dashwoods eagerly helped. Mrs. Dashwood squawked in protest when I didn’t look behind me and tossed a bunch of dead aster stems on top of her. Indoors, this year’s seed starting operation is much reduced from years past. I started marigolds, a little lettuce, a little kale, and a few of the free pepper seeds that came as a “gift” with my seed order. I decided to give up starting plants like tomatoes and peppers (except the free one) because they don’t do all that well in the garden. There is no sense giving over time and space to plants that don’t do well no matter how badly I want them. That is the main reason why we signed up for a small share in a CSA this year. I will let the farm grow my tomatoes and peppers and give over my garden to greens, legumes, squash, and edible perennials, the things that grow best in my conditions. The Friends School Plant Sale catalog is out for the big sale in May. I combed through it marking wishes as though I had an acre to plant instead of a couple thousand square feet. After I got the wishing out of the way, I made my tentative plant list. Depending on what does and does not come back in the garden over these next several weeks, I will revise the list a time or two before finalizing and printing it just before the sale in May. And by continuing to garden this way, by learning more and then doing more to help the plants as well as the wild creatures that inevitably show up—by practicing gratitude and enacting reciprocity—we begin to live in our place in a way that goes beyond human society only, and help create a path to a livable future. The wild native garden lays its stamp on us through its regional appropriateness. It changes us to something other than what we were. We settle in, become of the earth. Our perceptions of reality might change, and with them our allegiances. We might become more critical of the dominant culture. We might travel away from the colonialism being practiced on us, away from acceptance of the status quo. We might begin to learn other skills, might meet other gardeners who are making the same journey, might find we are part of a different community than the one we thought we belonged to. Something to meditate upon as I plan my garden and perhaps as you plan yours too. Consider your place and how you and your garden might be a reflection of that place rather than how you might impose your garden and your will upon it. We have had a mild winter here on Long Island but I am glad that spring is more or less here. We have not done much transplanting but we will be dong are planting soon. The first part of winter here was mild but the second part more than made up for it! Happy spring! Have fun planting! Our grass area is full of buttercups and daisies which I like. This year we have a project to create a wildflower patch…. Your chickens sound so amusing. Wish I had some. Tomatoes don’t do well in my garden space, either- I only get good ones if I keep them in planters on my deck- it’s the only space with real full sun. I’ve given up on a few things this year- no broccoli or melons- but went overboard with greens, and am trying a few new things like lovage instead of celery . . . I appreciate the quote you shared and am going over to read the full article, thanks for sharing that. Ah Jeane, the chickens were making us laugh so much! Perhaps one day you will find yourself with a small flock of your own. No melons for me either. I had a success with cantaloupe a few years ago and not once since. I have a lovely large lovage in a corner of my garden that I completely neglect and forget about until it is too big to harvest anything from. The flowers are pretty though and it smells nice. Good luck with yours! Does your lovage come back every year? I read it is a perennial but some people dig up and eat the root at end of season. It was mild here but it is cold again. I moved a quince bush last week as it was in the wrong place. It’s flowering and doesn’t seem to have been harmed by the move. My small cherry bushes are flowering and one of the plum trees is about to flower for the first time. Fingers crossed we don’t get frost. We have just about every weed you could think of coming up! Glad your quince seems to have settled in nicely to the new location. It always worries me to move larger things about so I am holding my breath and hoping everything likes its new spot. I hope you don’t get a frost. Always makes me nervous when the fruit is flowering and the chance of frost is not past. Chckens are so helpful! Gardening is such balm for the soul. Spring is here and things are in bloom… and we have decided to get chicks Easter weekend! So exciting! Love reading about the antics of the Dashwoods! I hope you’ll share some pics of the plants as they start to grow later in the summer. We have got to get out and do some gardening before our evil HOA people start getting on our case about the state of our front garden. Maybe this weekend!